What is the best way to view Stata’s PDF documentation? Stata's PDF documentation may be opened directly from the Stata menu or Stata's help system. Different PDF viewers behave differently, so here are some recommendations to enhance your experience. Currently, the default PDF viewers available from Microsoft and Apple are insufficient for viewing Stata's documentation. Please see the corresponding section for your operating system to see our recommendations. We believe that PDF-XChange Editor and Foxit Reader offer the best experience with Stata on Windows. Adobe Reader will work but with a caveat: Adobe Reader cannot go to a specific manual entry in a PDF manual from Stata if that manual is already open. Depending on the versions of Stata and Adobe Reader, the quality of your experience may vary. If using Adobe Reader, please read the recommended Adobe Reader settings for Stata's PDF documentation. Adobe Reader is the only option for opening Stata's PDF documentation from Stata for Mac. Other PDF viewers, such as macOS's Preview app, can be used to view Stata's PDF documentation; however, only Adobe Reader can be used by Stata to open a PDF manual and go to a specific entry. Adobe Reader does have one major limitation: it cannot go to a specific entry in a PDF manual from Stata if that manual is already open. For example, if the Base Reference Manual PDF document is already open in Adobe Reader because you were viewing the manual entry for regress, clicking on the intreg PDF manual link in Stata will bring Adobe Reader to the foreground, but it will not go to the manual entry for intreg because the Base Reference Manual PDF document is already open. You must first close the Base Reference Manual PDF document in Adobe Reader before it can go to a different entry in that manual. This applies only to clicking links to the PDF documentation from Stata. Clicking on links within the PDF documentation works as usual. Stata can tell Adobe Reader to automatically close a PDF manual so that it can reopen the manual and go to a specific entry. However, Adobe Reader has very limited user interface scripting support, so Stata achieves this by using macOS's accessibility control feature. 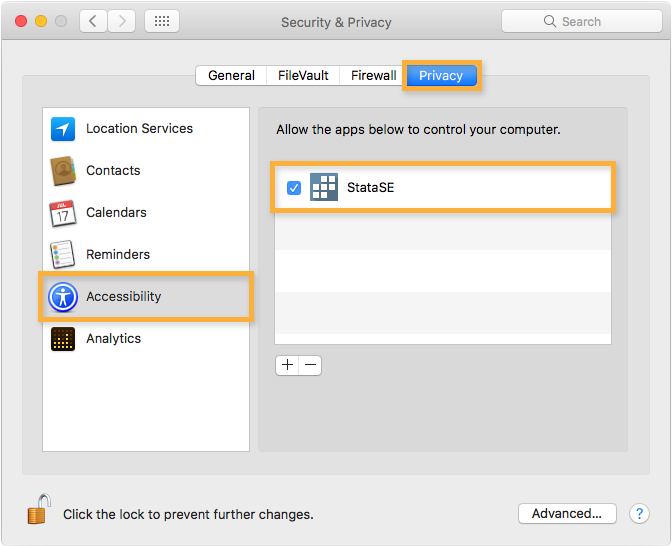 For security and privacy reasons, accessibility control of apps must be manually enabled on an app-by-app basis, so you must manually enable it for Stata. To allow Stata to automatically close a PDF manual in Adobe Reader, open the Preferences dialog in Stata and check the Close documentation using accessibility control checkbox. 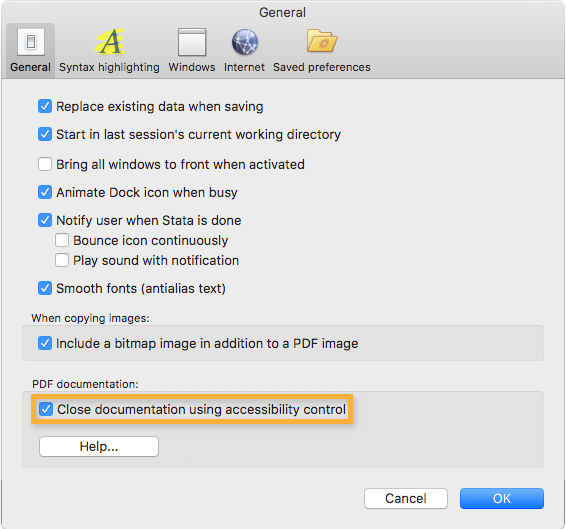 The first time you click on a PDF manual link in Stata after checking the Close documentation using accessibility control checkbox, the PDF manual will be opened in Adobe Reader, and you may be prompted by macOS to grant accessibility control to Stata. Click the Open System Preferences button and click the checkbox for Stata. If you don't see the dialog prompting you to grant accessibility control to Stata, it may be obscured by the main Adobe Reader window, so just move the window until you see the dialog. If you still don't see the dialog or clicking on a PDF manual link in Stata doesn't automatically close an existing PDF manual, you can enable accessibility control by launching System Preferences and clicking Security & Privacy. For more information about enabling user interface scripting, see the Mac Automation Scripting Guide. Once you enable accessibility control to Stata, Adobe Reader will go directly to any manual entry opened from Stata, regardless of whether its PDF manual is already open.